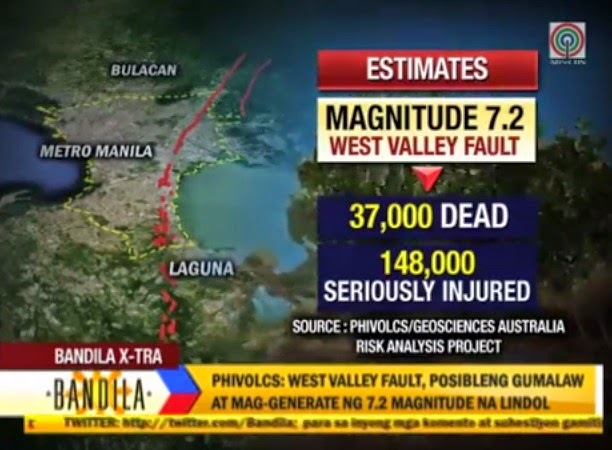 MANILA, Philippines - ABS-CBN's late-night news program Bandila aired a special report on Friday about a disaster that is waiting to happen, a magnitude 7.2 earthquake due to West Valley Fault that could leave an estimate of 37,000 dead in Metro Manila and Rizal Province. In a report of Gigi Grande, it headlines that Metro Manila must prepare for a strong earthquake that's long overdue. Philippine Institute of Volcanology and Seismology (Phivolcs) Director Renato Solidum said: "It might happen in our lifetime, it might take longer. But the more prudent thing to do is prepare." According to studies, projected death toll in Metro Manila and Rizal is around 37,000 or nearly 6 times more than the fatalities from supertyphoon Yolanda. Serious injuries are expected to run up to 148,000. 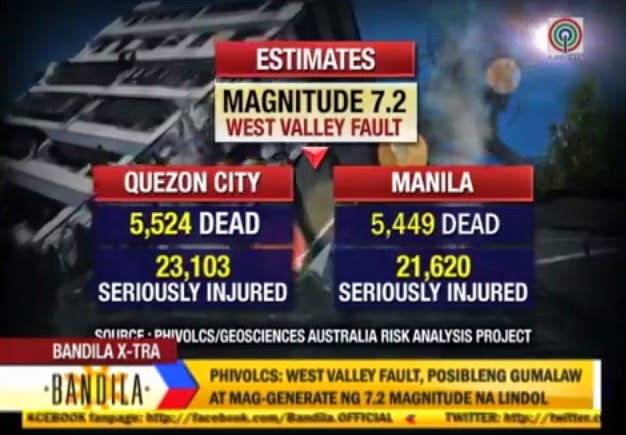 The highest casualties will be in Quezon City and Manila according to Phivolcs in partnership with Geosciences Australia under the Risk Analysis Project (RAP). 5,524 people could die in Quezon City alone, and 23,103 people could be seriously injured. In Manila, the projected figure is 5,449 people could die and 21,620 could be seriously injured. Based on the study of Earthquake and Megacities Initiative (EMI), the impact of the quake in Quezon City will be at the following barangays: Batasan Hills, Commonwealth, Bagong Silangan, Holy Spirit, and Matandang Balara. A total of 4,713 people will die in these five barangays; 14,707 others could end up seriously injured. 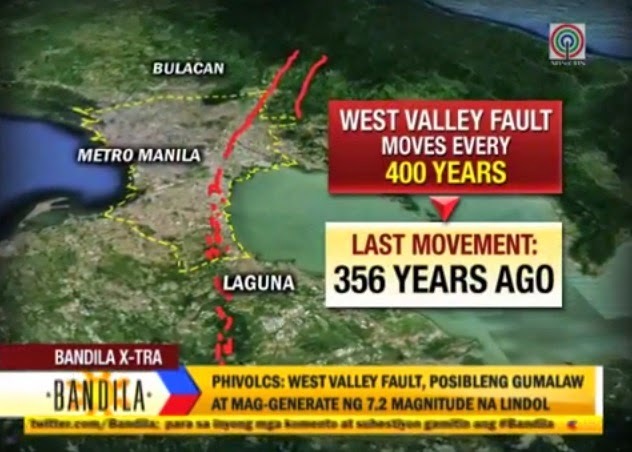 The 90-kilometer West Valley Fault runs from the Angat reservoir in Bulacan through Quezon City, Marikina, Pasig, Makati, Taguig, Muntinlupa, Rodriguez Rizal, Cavite and ends in Calamba, Laguna. It has moved four times in the last 1,400 years. The last time it ruptured was about 356 years ago. "It doesn't mean the next one will be 7.2, but it's capable of generating a 7.2 quake," Solidum says.